Something bad is lurking behind the trees - it's the Slim Soul Stealer! 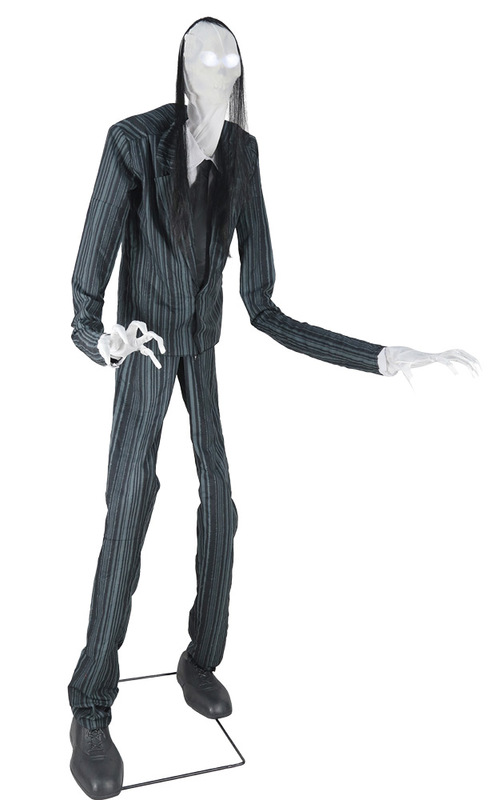 This terrifying character stands an imposing 7 feet tall and features a pale featureless face with glowing-white eyes and long black stringy hair. He is dressed in a thin pin-striped black suit and tie, and his two extra-long arms with creepy elongated hands give a disturbing look. The Slim Soul Stealer's eyes light up a glowing white, and his mouth moves as he turns his head and twists at the waist while saying one of three sayings ("Come to me my children, I will take you away. Come with me. You are all my children now. ", "Why worry about what lies ahead? I can ease your pain--ease your suffering. You have nothing to fear. ", "I am everywhere. I am always here. Watching. Waiting. Waiting for you."). Chilling! Plug the UL power adapter into any standard outlet and choose from Steady-On, Infra-Red Sensor or Step-Here Pad (included) activation options to operate. The infra-red sensor works up to 6.5 feet away and works in all lighting conditions - bright light to no light! Item includes volume control. Framework is made of easy-to-assemble quick-connect metal poles. Assembly is required.